Limited edition of 1866 prints 20" (524mm) x 29" (723mm), August 2006. The artist stayed in the heart of the Venice in October 2005 exploring all six of the sestieri or districts, where he photographed and sketched buildings for inclusion in his first Venice painting. He used the 'aerial' view from the top of the St Mark's campanile to orientate himself in this city known for its confusing network of canals and alleyways. Stuart's imaginary view for his Venice cityscape took a total of 10 months to complete and is unusual in that it views the city from the north west, with St Marks not in the foreground as with many Venice paintings. Venice, known as 'the most serene' (La Serenissima), developed on its lagoon mud banks for security. So successful was the protection afforded by the tides that the republic prospered for 1000 years and rich architectural heritage was here in abundance for Stuart's Venice painting. Conquered for the first time in 1797 by Napoleon the city-state was handed over to Austria the following year. It was not until 1866 that Venice was more or less free again, this time as part of the uniting Italian state. This significant date was chosen as the total for the limited edition print. The 18th Century Venice paintings by Canaletto and Guardi gave rise to the style called capriccio, in which buildings were relocated from their actual position for the benefit of the composition. This approach has been an important element of Stuart's Venice cityscape prints. In Venice the artist became acquainted with the panorama of the city drawn by Jacopo de'Barbari in 1500 and realised a combination of this aerial view with the capriccio style most closely reflected his mode of composition. Hence his invented term 'panoriccio'. 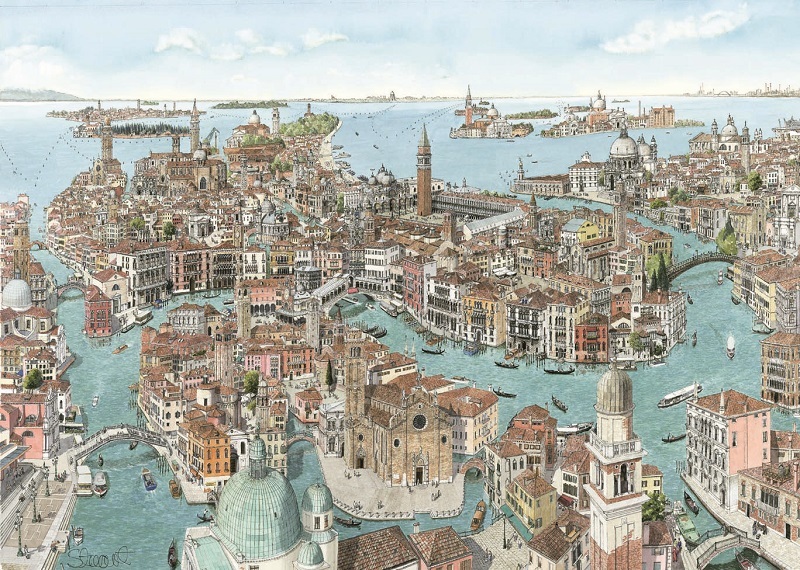 People who know the city should find most of their favourite buildings in this Venice print although a diagrammatic key is provided to help locate many of the famous landmarks.